It was the middle of a Tuesday and I found myself picking the date for an announced observation for the following week. We settled on December 12th at 8:45 am. That score will play a big part in determining my LOE score that will tell, at a quick, convenient glance, what kind of teacher I am. It’s hard not to absorb identity from that number. It feels like approval or disapproval. It feels like someone has pronounced judgement on my worth as a teacher. According to Ephesians 2, because Jesus Christ, fully God and fully man, came and brought me salvation by dying for my sin and rising again, this is my reality: I am loved by God with great love. I am God’s own handiwork, so I belong to him. I am created in Christ for good works, so the work is his, not mine. My future is not uncertain because God has prepared it in advance. God desires to show me the incomparable riches of his grace. He shows me great kindness in Christ. He gave me true life when I was dead in my own works and my own heart of hatred and defiance against him. As Paul tells the Ephesians to remember, I also remember that I was once without hope and without God in this world. I almost can’t bring myself to say those terrible, soul-shaking words aloud: without God in this world. I need to remember that, so that I can remember this: because of God’s great gift – one I did nothing to deserve- I have received approval by the One from whom it matters most. And I am no longer without God in this world… or in eternity to come. So, whatever comes today or the tomorrows that follow, as believers I hope this will always be among the first of our thoughts: I am no longer without God in this world. And may we remember all that that truth entails. Whatever is pressing or clamoring for attention, he always has been, and always will be more. His is the approval that matters most, so that we can live in true joy and seek to please him as we walk in all the good works – at school and elsewhere- he has planned for us to do. Laminate poster-sized sight-word word find and staple to presentation boards. (Glue gun won’t keep it mounted…) add paper copies for students to keep, a dry erase marker, and expo wipes (not pictured). I used binder clips to hold the presentation tri-folds together for easy assembly/disassembly/storage. :) This is for an outdoor school event and has 5 sides of advancing levels of word finds. The students really enjoyed it! To the teachers not yet on Spring Break: stay strong. And just laugh. When appropriate. Also known as the party corner. This was a fun way to start the first Friday of state testing. Within 5 minutes my 4th grade ESL class had come up with 25 English words and 3 Spanish words. I’ll admit… I let them use 1-2 letter words, too. 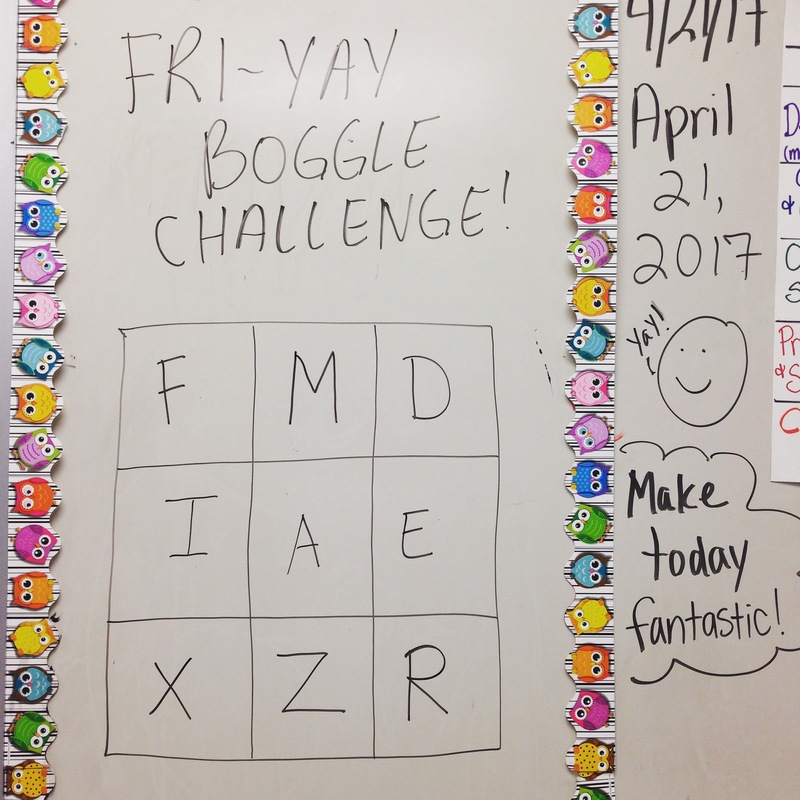 Rumor has it that there are at least 35 English and 9 Spanish words in this Boggle board. How many can you find?